Russellville High School Thespian Troupe 7260 recently participated at the Arkansas State Thespian Festival in Paragould, AR, where they received the “Critic’s Choice” award and their play “Stressed” was chosen to represent the state at the One-Act Showcase at the International Thespian Festival (ITF) in Lincoln, NE, this summer. “Stressed” was directed by Senior Katie Pipkin, stage managed by Dot Tanner, with Dany Stone, Annalee Drain, Anderson Elam and Christian Armstrong in the cast. The play details the lives of four high school students as they deal with the daily stress that comes with being a teenager. 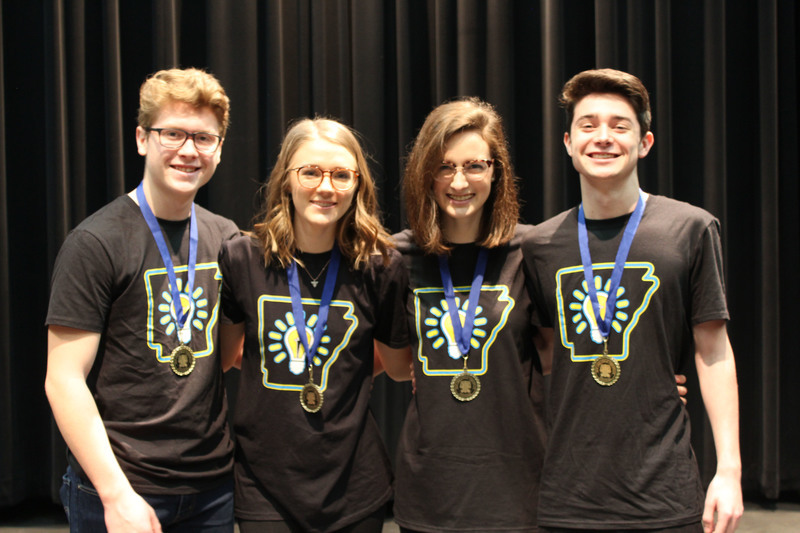 The following students received a rating of Superior at the State Thespian Festival, which includes an invitation to perform at ITF, Carolyn Etzel and Lucas Branch in Duet Acting, and Alex Jones and Annalee Drain in Duet Musical. 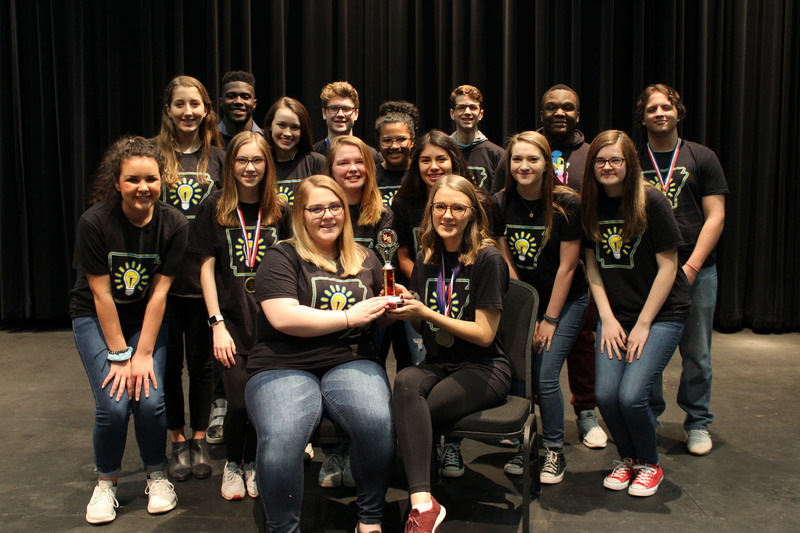 The Group Musical, “Play” from “Finding Neverland,” which was directed by seniors Kait Eastman and Annalee Drain, also received a rating of Superior at the state festival and an invitation to perform at ITF. Cast members are Dalton Turner, Jason Collins, Emma Crockett, Abigail Dollar, Anderson Elam, Lauren Gwaltney, Samantha Ibanez, Alex Jones, Lindsey Kinkade, Gavin Leavell, Katie Pipkin, Brooke Pyle, Addison Smith, Avery Stahl, Gabriella Stiles, and Tyeshia Threats. Receiving ratings of Excellent at the state festival were actors Marie Heinen, Tabitha Pace, Waleska Chacon, Samantha Ibanez, Dany Stone, and Holly Kirkpatrick. Also receiving ratings of Excellent were Jason Collins, Dalton Turner, Emma Crockett, Breanna Peel, Katie Pipkin, Skyler Price, Lindsey Kinkade, Alex Tanner and Kait Eastman. Group Acting, directed by Lucas Branch and Raichyl Lesser, received a rating of Excellent and included actors Matthew Cottrell, Holly Kirkpatrick, Elaina Owens, Breanna Peel, Skyler Price, Jaxon Smith, Larry Smith, III, and Dany Stone. 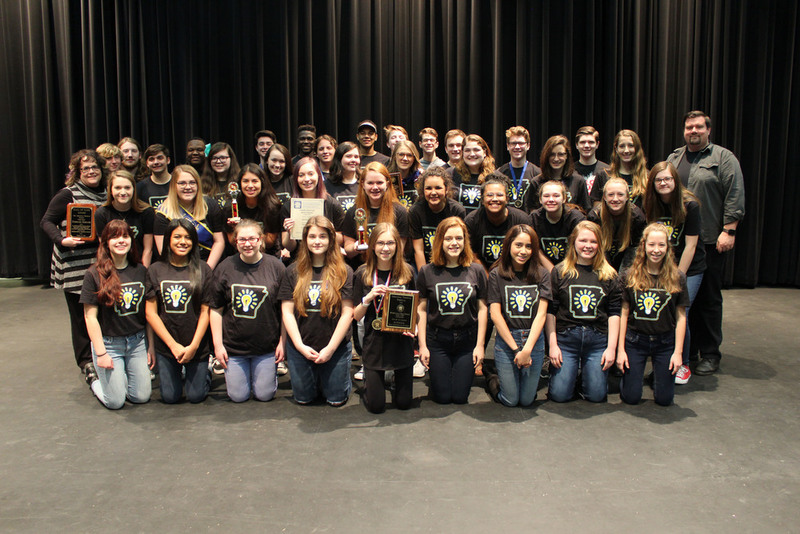 Cyclone Theatre had two Tech Challenge teams compete at state as well. Tech Challenge is comprised of five events which are cable coil relay, hanging and focusing a light, prop shift, knot tying, and backdrop fold. Team A, comprised of Kait Eastman, Raichyl Lesser, Lindsey Kinkade, Brooke Eastman, Dax Carreiro, and Star Douangchanh took 4th place overall. 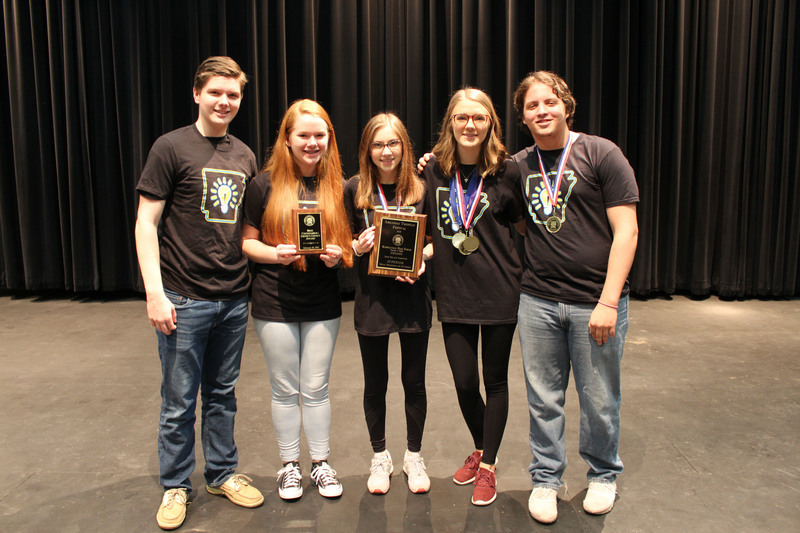 Team B, comprised of Dot Tanner, Anna Vogler, Charlie Lavendier, Elaina Owens, Avery Stahl, and Lily Watson took 1st place in the cable coil relay and 2nd place overall. 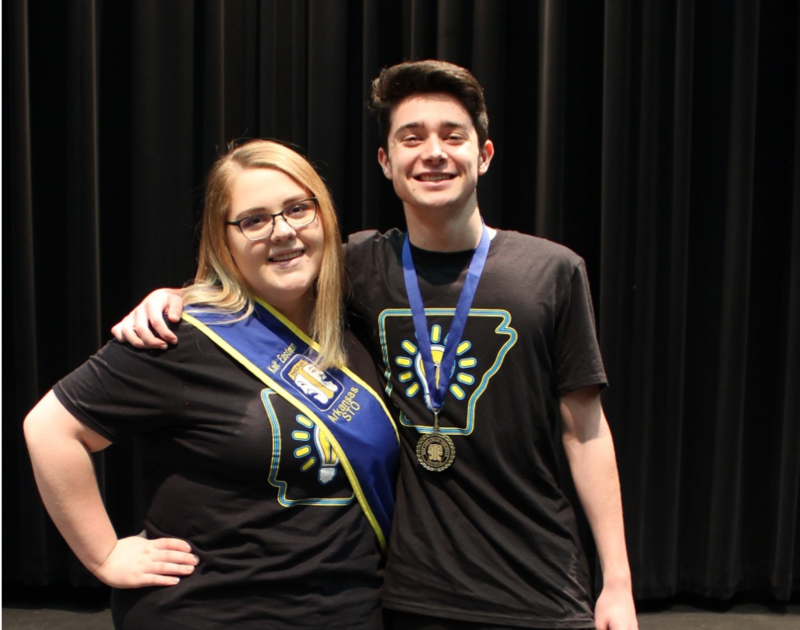 RHS junior, Lucas Branch, campaigned and was voted by the state delegation to be a State Thespian Officer for the 2019 Festival. This will include intensive Leadership training at the International Thespian Festival and attending a planning Leadership weekend this summer in Arkansas to prepare for the 2019 Festival. At the awards ceremony, Stephanie Schultze, RHS troupe director, and teacher was chosen to be a charter member of Arkansas Thespian’s Hall of Fame.